We decided to wash the bed sheets yesterday. We rotate through a couple of sets, and needed some clean sheets. In summer, we just hang our laundry on the outside line to dry. 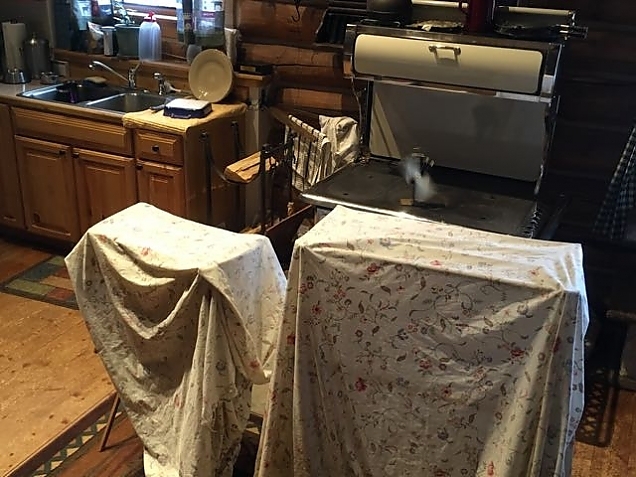 But, when it is 21° outside and snowing, we use some wooden drying racks that we place in front of the wood stove. We have a fan on the stove that is powered by the heat of the stove and it provides just enough air circulation to make quick work of drying any clothes hung on the rack. You can see the blur of the fan in this photo. Smaller items can be laid across the many wooden bars on the racks. For the sheets, we just drape them across. We did two loads: the sheets and the duvet cover. It was great sleeping in clean sheets last night! The dogs and cat really enjoyed it too.